Mega Scan Pro with its built-in features and included accessories and special advanced technologies, is considered a professional device for all metal detection activities in all terrain. Mega Scan Pro is a versatile device as it contains three search systems and can detect various metals types like gold, silver, bronze and platinum. In addition to it can detect cavities like tunnels and hidden rooms underground, also it can detect diamonds and gemstones. The powerful metal detection technology in Mega Scan Pro, was classified in first ranks globally by German and international organizations working in field of gold mining and metal detection. Mega Scan Pro is the best specialized device. It has been developed exclusively to detect various types of metals, gold, diamonds and cavities underground, with powerful features and reliable results. Mega Scan Pro works using high-precision frequencies to identify all different kinds of metals in all types of soils and terrain. The device has been manufactured using high quality plastic materials. Its electronic circuits are not affected by heat or coldness. Mega Scan Pro has a simple easy-to-use multilingual graphical user interface that is available in 8 international languages. The user can select one of them from the Languages menu when the device is turned on. The device will still work in this language even after the shutdown and restart. All components and parts of Mega Scan Pro device are protected with sponge and placed inside high-quality waterproof bag. – Super Sensor (Magnetometer) used for Magnetometer search system to detect magnetic metals and cavities. – Deep Master (the depth measurement unit) comes with 2 antennas and 3 pegs. The antennas must be plugged to the two sides of the unit. The 3 pegs must be attached to the unit and then planted in the ground. – Durable Lithium battery that lasts for 15 hours of continuous usage and operation. – AC charger for charging the battery and Deep Master unit. – An instructional Training DVD disc about how to use the device. Mega Scan Pro device incorporates a lot of smart and advanced technologies for detection of gold, precious metals, diamonds and cavities . Mega Scan Pro includes Mega Detection technology which detects buried targets signals by using special antennas designed exclusively to recive the weakest signals from buried targets like diamonds. The most important feature of Mega Scan Pro is the ease-of-use feature with ergonomic, comfortable design of the systembox, and its handle. It has easy-to-use control panel for adjusting device program settings and high-resolution colored display screen as well as a simple software program for both individuals who are using the system for the first time or professionals. Mega Scan Pro includes advanced long range locator system that has been devloped exclusively for this device by Mega Locators. It has high-accuracy built-in technology that receives emitted signals from gold and different types of metals, diamonds and gemstones using search antennas. The antennas are supported with additional signal boosting radar. The signal reception range starts from 250 meters and up to 2000 meters in the front range. In extreme depths, It is up to 40 meters in the ground. It has accurate determination of the size of the target and signal strength via a built-in analytical program in Mega Scan Pro system. Search is done by selecting specific search program in “Search” menu then the device will load the selected program, and after that the screen will display a graph with search distance range at the left side and depth range on the right side. 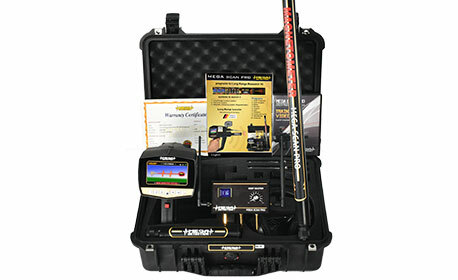 Mega Scan Pro has a unique sensitive Magnetometer system that used to detect magnetic or ferrous metals like iron , and also underground cavities like hidden rooms and tunnels. This powerful system depends on a special sensor (Super Sensor or Magnetometer) . It works using advanced technology designed exclusively to measure magnetic fields emitted from burried ferrous metals and convert its signals into audio signal. Mega Scan Pro include a unique Ionic Scan system used to detect ionic radiations emitted from long time buried gold treasures and ancient artifacts in the ground. Generally every metallic object buried underground has ionic field around it, and the radiations emitted from this field are increased over time. Thus, the longer the body is buried underground, the greater the ionic field around it. Mega Scan Pro can detect emitted ionic fields radiations from long distances, using powerful Mini Sensor which recive radiations and convert it to an audio signal and display indicator on the screen. This new technology included with the device. Laser Locating System is used to determine the right direction of the detected target from a long distance and help the user locate its direction visually. The device works using durable lithium-ion batteries. It can be easily charged and it provides between 10-15 hours of contious operating time. The customer can request additional batteries . The device is also provided with the a normal charger and travel adapter .